Provides abnormal reflex arc neuro therapy for patients with spasticity. 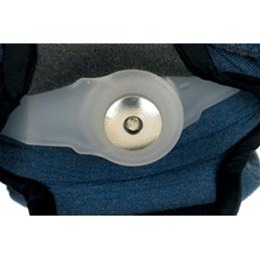 single setting static hinges should be set 15 degrees "ahead" so that when applied, the brace will "flex" into the contracture providing a "stress-relax" neuro-onhibiting therapeutic extension stretch. Orthotic therapy for mild to moderate (< 90°) adaptive tissue shortening contracture of the elbow. The flexible uprights will “give” with an involuntary episode of tone. Excellent for treating elbow contractures for patients with spasticity. The elbow should demonstrate good end feel to passive stretch and significant gains in ROM should be anticipated. Effective treatment to full joint elbow extension and for prophylactic maintenance of full ROM as needed. The DynaProÔ Elbow single setting hinges should be set at 15° of greater extension than comfortable end range passive stretch (i.e., with elbow contracture of 45 degrees, both uprights are set at -30° degrees). 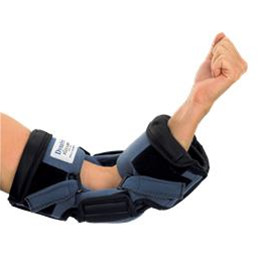 When applied, the brace will “flex” into the shortened tissue applying a neuro-inhibiting extension stretch. The unique flexible properties of the elbow orthotic device will facilitate muscle inhibition to predispose the affected joint(s) to the benefits of Low Load Prolonged Stretch (LLPS) provided by the orthotic. By increasing wearing time to three to six hours per use, the Total End Range Time (TERT) of device wear allows the Muscle Spindle to re-set at a greater resting length, providing long effects stretch and permanent increases in joint range of motion over time. The device should be modified by resetting the hinges as needed into greater extension every 6 to 8 weeks to continue contracture reversal. Orthotic treatment should be continued until function is restored to the affected joint. For elbow extensor contractures, the DynaProÔ Elbow orientation can be reversed (upper cuff on triceps; lower cuff on volar side of forearm). An accessory Hyper-X Elbow Pad must be ordered, which replaces the elbow cap to provide a pull lever at the crease of the elbow to pull the elbow into flexion. Child DP FE20724-C 5" - 7" 3.5" - 6.5"
Youth DP FE20724-Y 7" - 10" 5" - 7"
Small DP FE20724-S 8" - 10" 5" - 8"
Medium DP FE20724-M 9.5" - 11.5" 7.5" - 10"
Large	DP FE20724-L	11" - 14" 9" - 12"